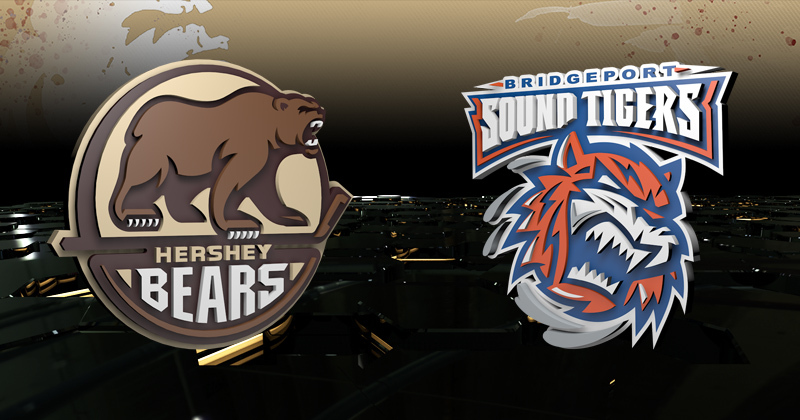 Game Preview: Sound Tigers at Bears, 7 p.m.
03/16/2019 - The Hershey Bears conclude their weekend with a 7 p.m. home tilt against the Bridgeport Sound Tigers, American Hockey League affiliate of the New York Islanders. The Bears look to rebound after falling in overtime the previous night to the Toronto Marlies, 5-4. Bridgeport was idle last night, and last played on Mar. 10. RADIO: WQIC-100.1 FM, WOYK 1350-AM, Fox Sports 1460-AM, Voice of the Bears Zack Fisch, Mitch Lamoureux and Jim Jones on the call. The Bears fought back last night to earn a point, but fell to the Toronto Marlies, 5-4, in overtime at Giant Center. After a scoreless first period, the two teams combined for six goals in the middle frame as Toronto took a 4-2 lead through 40 minutes. Hershey rallied in the third period to tie the game, as Garrett Pilon tallied at 10:34, and Devante Smith-Pelly scored at 12:05. The Bears ran into penalty trouble all night long, and the Marlies finished the night 3-for-9 on the power play, with Chris Mueller scoring the game-winning goal on the man-advantage in overtime at 1:39. The Sound Tigers also played Toronto in their last contest, earning a 3-2 shootout win last Sunday on the road. Otto Koivula had the shootout winner. Several Hershey Bears enter tonight's game on point streaks. Devante Smith-Pelly leads the way for Hershey, collecting points in five straight games. With a goal and an assist last night, Smith-Pelly has nine points (five goals, four assists) in that stretch. Nathan Walker (one goal, six assists) and Jayson Megna (four goals, five assists) each have points in four straight games. Hershey defender Tyler Lewington also has an assist in three straight games, a mark tied for the longest point streak of his career. Megna's four-game goal streak ties the longest by any Bear this season with Riley Barber from Nov. 10-23. Tonight marks the fifth meeting between Hershey and Bridgeport this season. Hershey is just 1-3-0-0 versus the Sound Tigers this year, and the Bears have dropped the last two games in the season series. The Sound Tigers and Bears last met on Mar. 2 at Giant Center as Travis St. Denis had a goal and an assist to lead Bridgeport to a 4-1 win. Bridgeport's top scorer in the season series, Michael Dal Colle (six points) won't be a factor in tonight's game as he's currently recalled to the Islanders. Tonight's game could be a playoff preview. If the postseason started today, the 2nd place Sound Tigers would play the 3rd place Bears in the opening round of the Calder Cup Playoffs. Hershey enters tonight's game trailing Bridgeport in the standings by four points. Hershey forward Garrett Pilon leads the Bears in the season series versus the Sound Tigers, striking for four points (two goals, two assists) in the four head-to-head contests so far this season. The 3rd round Washington draft pick leads Hershey rookies in points with 28, striking for eight goals and 20 assists in 63 games this season. He tallied a goal and an assist in last night's loss versus Toronto. Pilon has family ties to the NHL affiliate of the Sound Tigers, the New York Islanders. Pilon's father, Rich, a defender who skated in 631 NHL games, played 12 years for the Islanders from 1988-1999.